1. Describe your new book No Angel in a single Tweet. Boy thinks life at an all-girls school will be heavenly, but it’s hell on earth. And he’s the angel sent to fix things. Help! 2. Do we need to have read your first novel, Fang Girl, to enjoy No Angel? Nope, they’re entirely unrelated to each other. Well, apart from containing the same brand of humor! Even though No Angel isn’t a sequel to Fang Girl, I hope that readers who enjoyed the way I affectionately mocked vampires in my first book will get the same sorts of giggles from the way my new one makes fun of the whole ‘angel boyfriend’ subgenre of paranormal romance. 3. 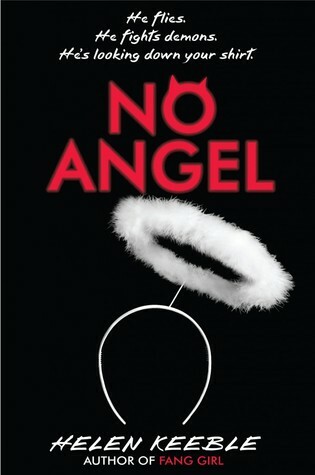 Is No Angel a stand-alone novel or the start of a series? It’s definitely a stand-alone novel. Not to give away any spoilers, but the plot is very much wrapped up at the end of the book. 4. Why did you decide to set No Angel at a boarding school? My dad went to various VERY traditional English boys’ boarding schools from the age of seven to eighteen, and although he doesn’t talk much about it, he’s told me a few horror stories. I’m fascinated by old-fashioned boarding schools as these little self-contained worlds, with their own history and culture, completely isolated from normal life. Due to Harry Potter, I think most of us now have a pretty romantic idea of boarding schools as a magical wonderland, but they could just as easily be (and often were) utter hell-holes. Bullying is bad enough, but when you can’t even get away from your tormentors at the end of the school day…? Scary! 5. Your vampires in Fang Girl have some unusual (for the paranormal genre) traits based on traditional Eastern European folklore. Have you done anything similar with the angels and demons in No Angel? 6. Fun fact about No Angel? I guarantee it’s the only light, fluffy YA comedy you’ll ever read that includes higher-dimensional mathematics as a pivotal plot-point. 7. Would you rather be an angel or a vampire? Although I have to say I would prefer to be an angel from someone else’s book, not my own. The angels in No Angel are… not exactly eye-candy. 8. What are your favorite books, shows, or movies about angels and demons? For books, Good Omens by Terry Pratchett and Neil Gaiman. I’m also very fond of The Demon’s Lexicon by Sarah Rees Brennan. 9. Favorite funny movie or TV show? Galaxy Quest, which is a movie about a group of actors from a second-rate, long-cancelled TV science-fiction series (which is of course in NO WAY based on a real TV show *cough* Star Trek *cough*) who get abducted by real aliens, who have based their entire culture on the show. Or, as the aliens call it, “the historical documents”, as they believe it’s all real. Hijinks ensue! If you are at all aware of science fiction fan culture, Galaxy Quest is screamingly funny. The fact that I went to Star Trek conventions as a teenager, owned a lovingly-painted collection of Enterprise models, and once won a Halloween costume competition with my home-made Spock outfit, may go some way to explaining my deep and abiding love for this movie. So I was, for want of a better word, an angel, possibly with a holy mission to protect the world from the forces of evil. Obviously there was one thing I had to do as soon as possible. The next morning I got up at the crack of dawn, liberated a helmet from the communal bike shed, and set off to learn how to fly. A half-hour hike found me a nice wide clearing in the woods, well away from the school buildings. With a last glance around to check for onlookers, I shrugged my wings out. Early morning mist scurried along the ground as I lofted them to full vertical extension, the glowing pinions reaching for the sky like outstretched hands. I crouched, looked up, and took a deep breath. “Okay,” I said softly, and swept my wings down. It was a good thing I’d worn a helmet. After another ten minutes of running, leaping, and rather unangelic swearing, I was still resolutely earthbound. I brushed the mud off my knees, scowling. Maybe what I needed was motivation. I’d certainly had plenty last night. Unfortunately, I didn’t think Faith would appreciate her own guardian angel pushing her out a window, not even in the interests of science. And I wasn’t quite confident enough in my wings to want to throw myself out of a window, either. “Oh my God,” said a voice behind me. I leapt into the air in alarm — literally. A short mid-teens girl in a baggy cardigan and unflattering glasses stood frozen in the bracken, staring at up me with her mouth hanging open. “You’re… you’re an angel,” she said. As I was hovering six feet above her on glowing, slowly-beating wings, this did not seem like something I could deny. The rising sun highlighted the girl’s tear-tracked face and red eyes. She took a hesitant step forward, holding up a hand to shield herself from my light. “Who are you?” she breathed. The girl stared at me. She did not look like she considered this to be Glad Tidings. Interview with P.T. 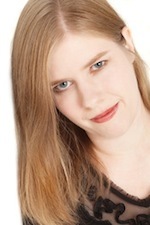 Michelle, author of Brightest Kind of Darkness, and Giveaway! Donna I like this gal and would enjoy her book as well – I even went to enter the giveaway for a signed copy of her book. Fun – writes with humor, as you do.